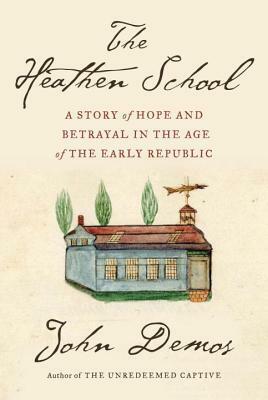 I first heard of John Demos’ latest book, The Heathen School on an NPR Books podcast. They featured a great teaser for the listeners and it certainly piqued my interest. The premise of this school was to bring in “heathens”— native americans and asians predominantly, educate in the language, religion and culture of a Christ-centic New England and subsequently unleash them as missionaries on their “primitive,” non-Christian homeland and community. A great plan right? The only problem was that living breathing imperfect people were the guinea-pigs subjected (albeit voluntarily) to live out the founders’ theories on cultural and religious assimilation. Things did not go according to plan right from the start. While I find the history of attempting to evangelize these cultures into Christendom interesting, I was unable to engage fully with this book. I do believe it was extensively researched and thought out, but I was not sufficiently equipped to take in such serious depth and heavy detail on the subject. So, instead of dropping the whole notion of learning about the history of attempted cultural, religious and ethnic assimilation in North America, particularly as it pertains to local Aboriginals, I decided to take another run at the whole saga of strife; this time at a slightly lighter level. On a fairly recent rambling adventure of mine into the world of BookTube, I came across The Book Junkie, a Literature student who is most definitely a woman I can relate to. She highlighted for her viewers a book that I had not heard of before, and then praised it significantly. 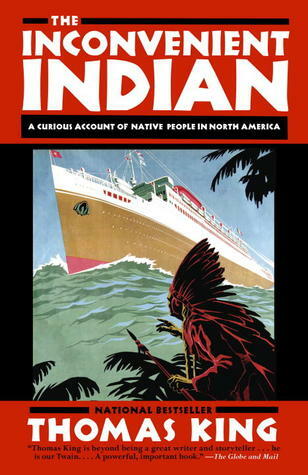 The Inconvenient Indian: A Curious Account of Native People in North America by Thomas King is a vivid selected recounting of a long, unfortunate history of conflict between two extremely different cultures. King writes honestly, and with obvious frustration directed not only at the long gone centuries of imposed obsequience, but the present-day repeating of such transgressions on the part of the North American “white” population. While I found the author’s style of writing much more engaging for my sensibilities when set up against the John Demos style, I did notice that sarcasm was utilized as the dominant form of humour, which at times made me ponder more critically on the openness (I won’t call it objectivity because the nature of the account is obviously subjective) of the information we were given on certain historical (long-past or recent) events or occurrences. Regardless of my slight uneasiness with the sarcasm, I learned A LOT about the historical relationships of two people groups with very different cultures and religions. I learned too about the current state of affairs (published in 2012, so quite close to present-day), contentions and prospective collaborations. Very helpful for a girl who grew up with very biased, stereotypical, even racist role-models and peers. I would encourage all people, no matter what side of the ethnic line you reside on, to pick up The Inconvenient Indian and dive in with an open heart. If you only read one book in honour of National Aboriginal Month this June, make it this one. There have been several significant developments that I am aware of after this book went to press, and in 2013 The Year of Reconciliation was declared in certain cities in Canada, including my hometown of Vancouver— to raise further awareness, to come together and to apologize specifically for the imposition of Industrial and Residential school programs on the Native children across Canada and the United States. We unfortunately still have a very long unmarked path to walk when it comes to true equality and freedom, but as more and more individuals get informed, get involved and potentially get engaged on the subject, the closer we will find ourselves to a satisfactory, even harmonious, coexistence for everyone involved. This entry was posted in Muse Reviews, Reflection and tagged Aboriginal, book recommendations, Book Review, Christian, History, Native, North America, Reconciliation. Bookmark the permalink.